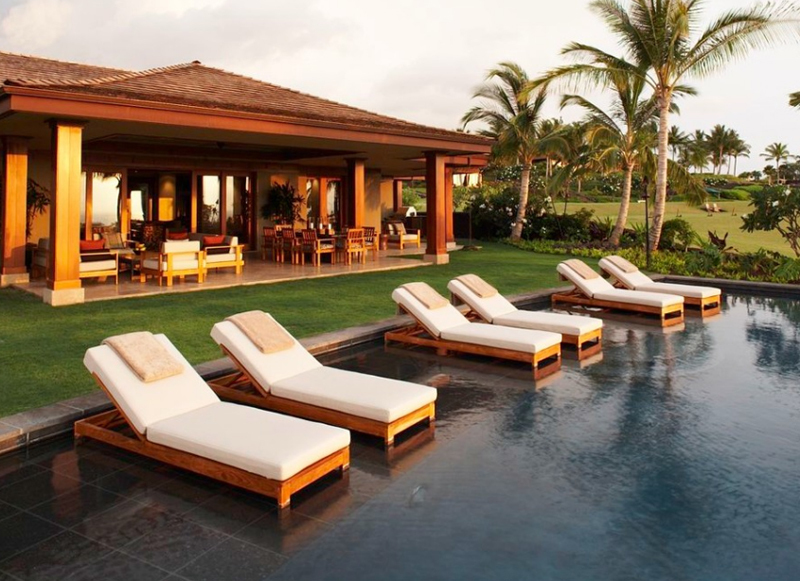 It would be more comfortable to lounge by the pool with cushioned chairs. I have always dreamt of having our own pool in the backyard as a child. Well, because when we were younger, our family would go to a hotel in the city and go night swimming with family friends; but then again, when I studied how to go about swimming pools, maintenance is quite expensive – so, well, I changed my mind about that already. 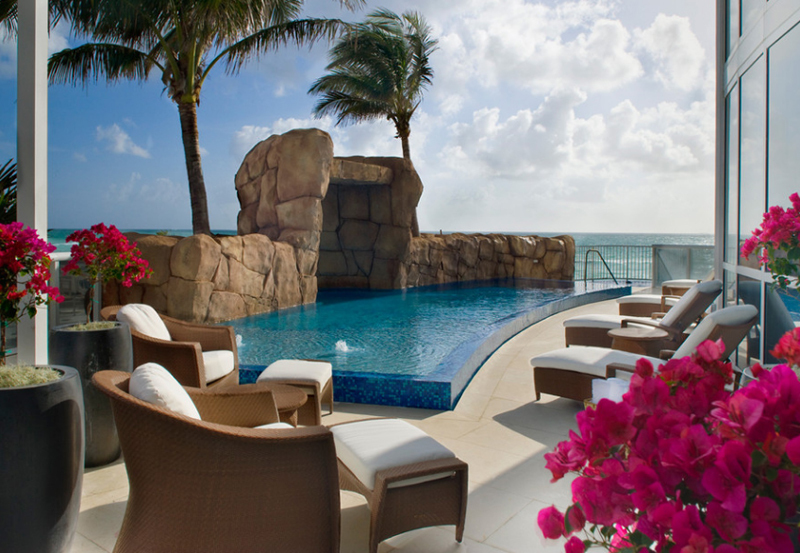 So for today, we will be showing you a list about 20 Charming Chair Cushions by the Pool which I think are real neat. They come in different colors, designs, materials and kinds; all that they have in common is that they are used for lounging or sitting down by the pool side. Check out the chairs because there are some that are surely stunning. 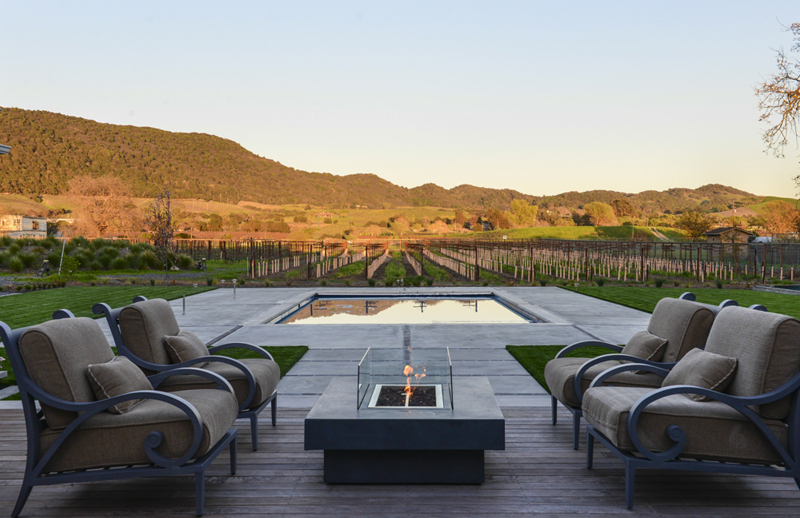 Check out the first one on the list – this is a lounge chair chosen by Ames Ingham for this stunning luscious space. The white cushions paired with the white large umbrellas surely are the secondary high light in this space after the sweet swimming pool and Jacuzzi. With all the greens around, using white surely made everything look real expensive – even the white fence on the background. I kind of love the idea of using different, coordinated colors for the cushions in these lounge chairs. As much as the pool has this blue background, the use of blue cushions made it really neat. In a home with bricks and wood (like what we see in this background), the thought of colorful outdoors make it really fun and inviting. These chairs in this photo, I personally like. 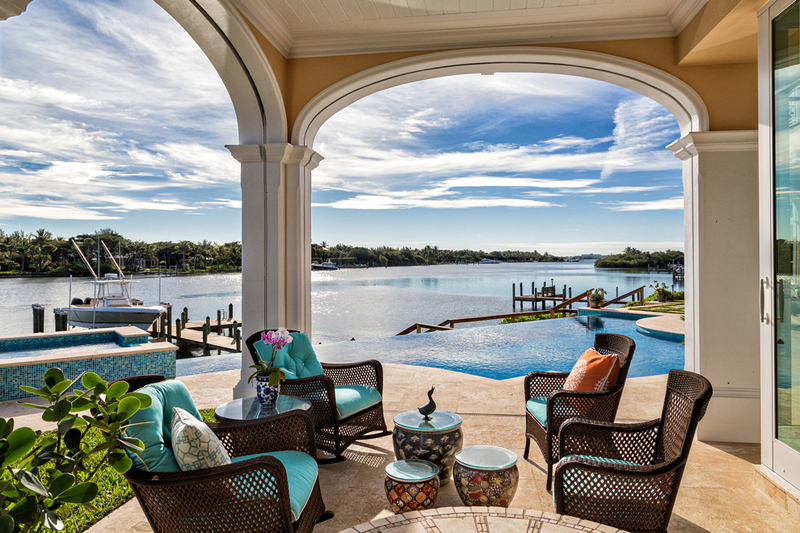 Aside from the nice variety that we see in here – the slender chaises and then two wider lounge chairs seem pretty – I mean, look at how symmetrical this view looks like; from the windows and doors on this part of the house itself and the arches on the sides too – well, what more is there to say? When I first saw this pool area, I got attracted at the thought of this place being on top of a hill or something. The view is just spectacular and pretty much breath-taking! 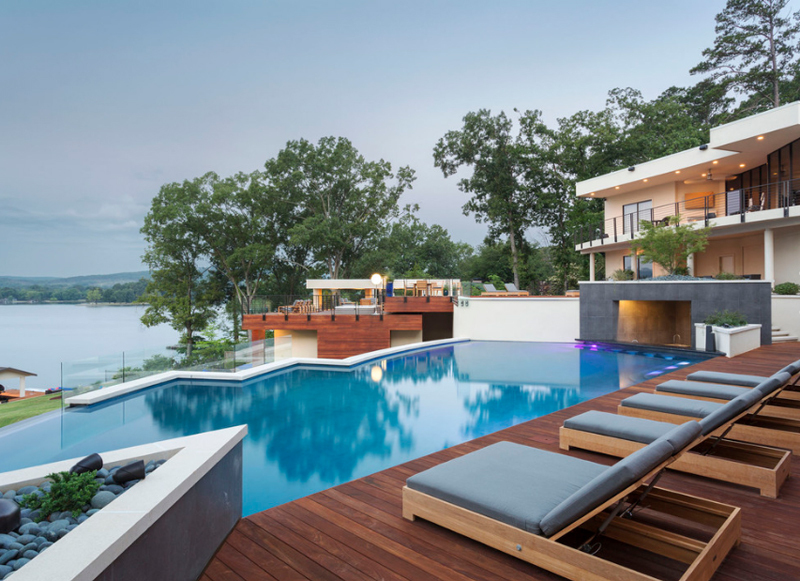 Having the pool face the great blue sky is just a great treat the designer made sure that the client would love and the people who would be coming to visit this place. The striped cushions on the lounge chairs in this pool area are just sweet. Most of the time, I’d see white and blue combo – especially when it is by the pool but then I saw this – and it just looks wonderful. It’s not so much as a new combination or whatever but I think that it’s nice to look at. Very neat and classy. They surely stand out in this photo. Now, this one you should really see – okay, I know that there are other beautiful roof decks out there and then when you see this and you will say that your swimming pool in your roof deck is prettier – but look at the stunning greens surrounding this house! The aerial view of this place is just fascinating as it is wonderful. I can’t say what plants of those are even plants – after the pool area. This space is just too large to even look at! I mean, right? I am totally in awe every time I see this picture – we might not see the greens in here clearly, but the fact that you’d see all this every time you are in this home is just wonderful – or at least I think that. This beach house is another story. Honestly, I find it confusing why people still have swimming pools in their (beach) homes when they can just go out and enjoy the beach! I know though that beaches can sometimes not be too inviting or whatnot – but from this photo, I can see that the home owners in here are just too lucky to have their homes here. 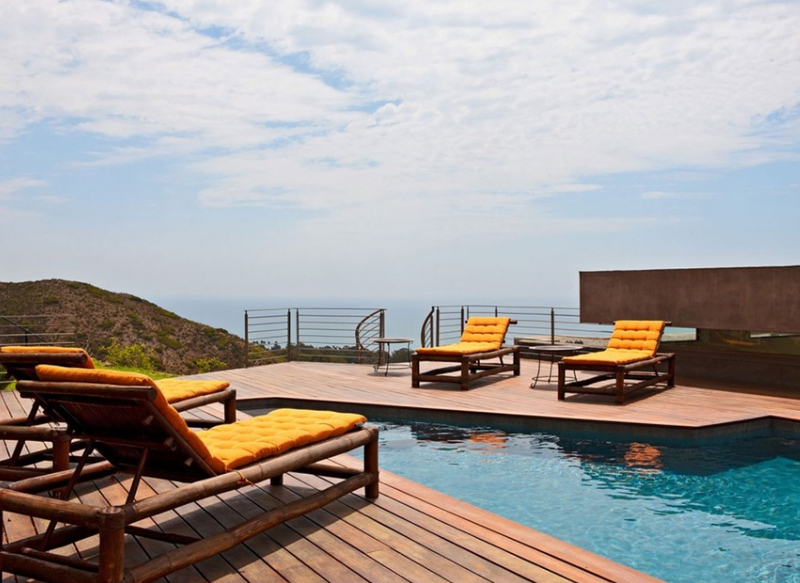 I love decks like this one – the thought of having wooden pathways or whatnot around your pools. They look sweet and really homey. 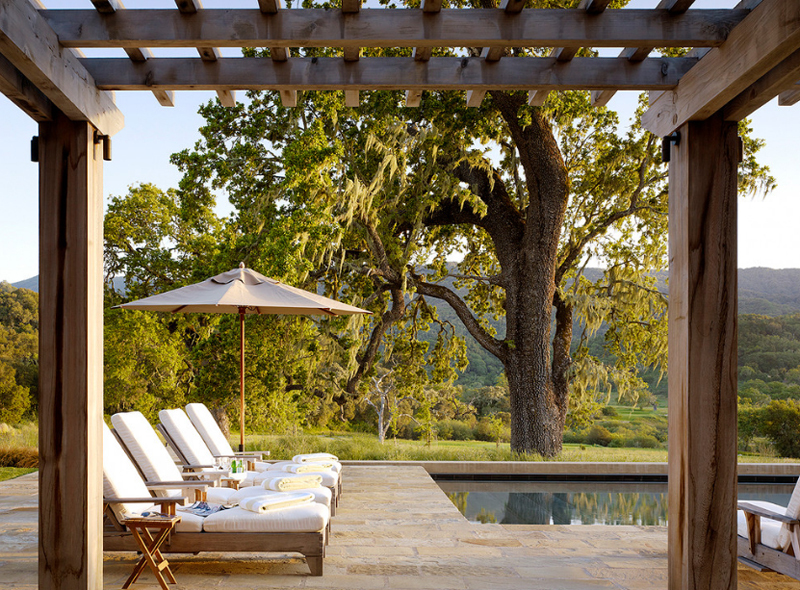 The ranch house we had above has a similar setting too – wooden planks or panels are surrounding their pools and it just stunning. The contrast on the color of the wood complements with the color of the lounge chairs in here and cushions too. 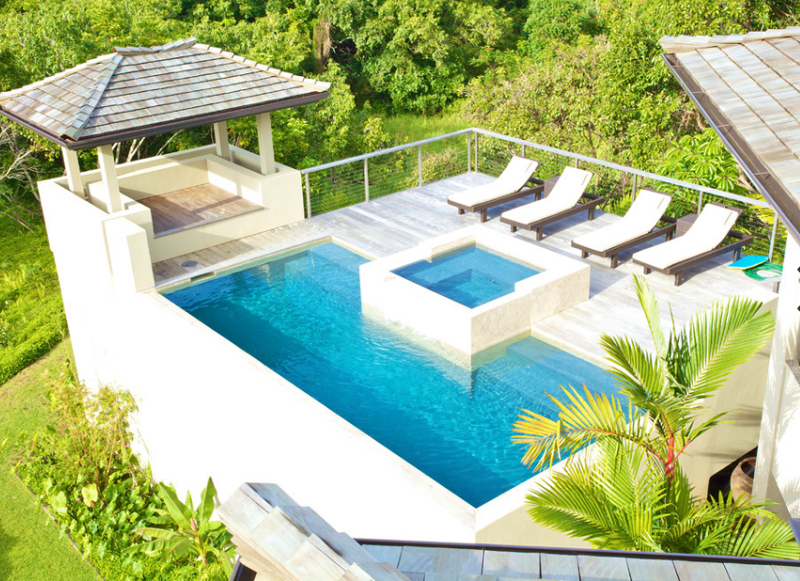 This slender swimming pool sure looks unique and fancy. The blue tiles match well with the color of the sky and complement with the white and brown combination of lounge chairs and arm chairs around it. Adding tropical plants in here makes this space feel more like a vacation spot than a house. 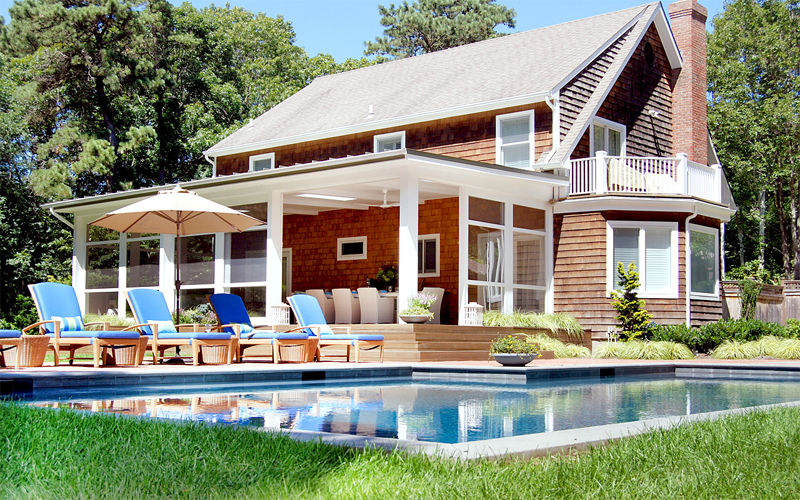 The white cushioned lounge chairs in here match well with the color of the house. I like how this place is surrounded with a lot of greens which I think could be a golf course. 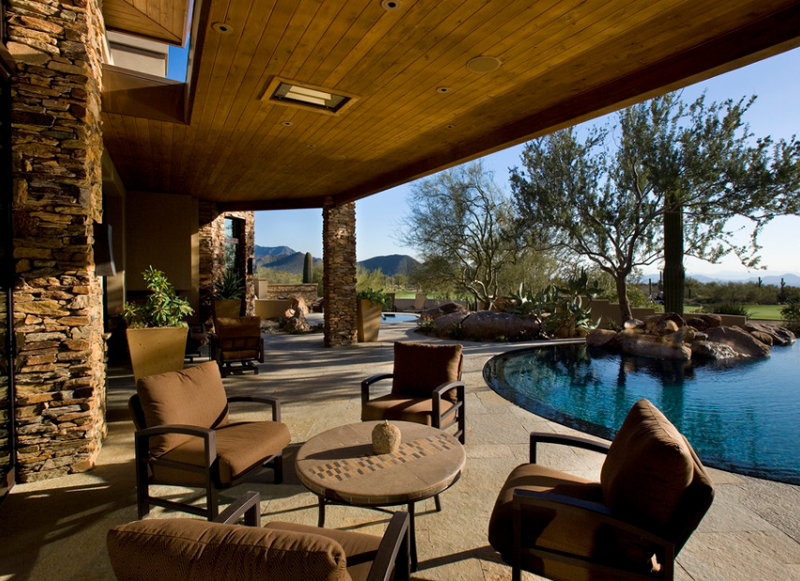 If I had this space to myself, I think a lot of my friends would be coming over to have drinks and party! The lounge chairs in here look really modern and fancy. I mean, lounge chairs could actually look similar to one another and I think it’s real neat. This house in itself is real fancy and modern because of the lines evident in it. The sky in this picture may be the first thing that you’d be looking at and why not! This space is just really stunning. If all the adjectives could be placed beside each other, this spot is it – enchantingly beautiful. Is that even legal to have a place this beautiful? This trellis sure is a great entrance way to the swimming pool area. I love how places like this one actually exist. Most of the pool areas that I have seen around town are enclosed in buildings – like indoor pools, on roof decks perhaps and even around a beach – never around plants and trees and even a mountain! This is just lovely surroundings to be around in. I can’t say that this place has too much browns in it because homes like this one sure utilizes brown like there’s no tomorrow; of course this is not a bad thing. Earth colors are very prominent in ranches, and haciendas like this one. The desert feeling of this space is cool too; I don’t know what it is about it. 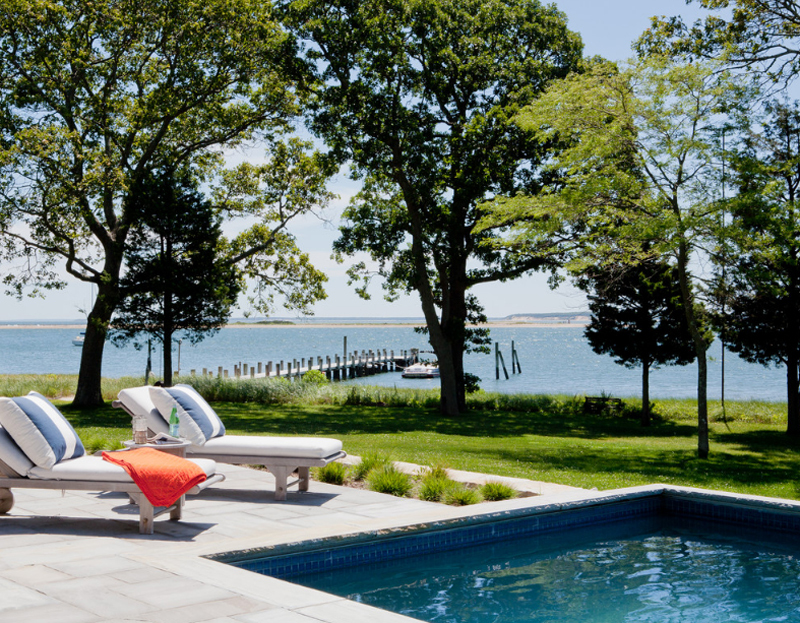 What about bright colored cushions for your outdoor pool chairs? It might be distracting at one point but, why not? It catches attention and if you are into inviting people over for parties, these are great conversational pieces. I don’t know why this home is named Tradewinds, really; but I find it interesting. This outdoors is just neat and ideal for parties! 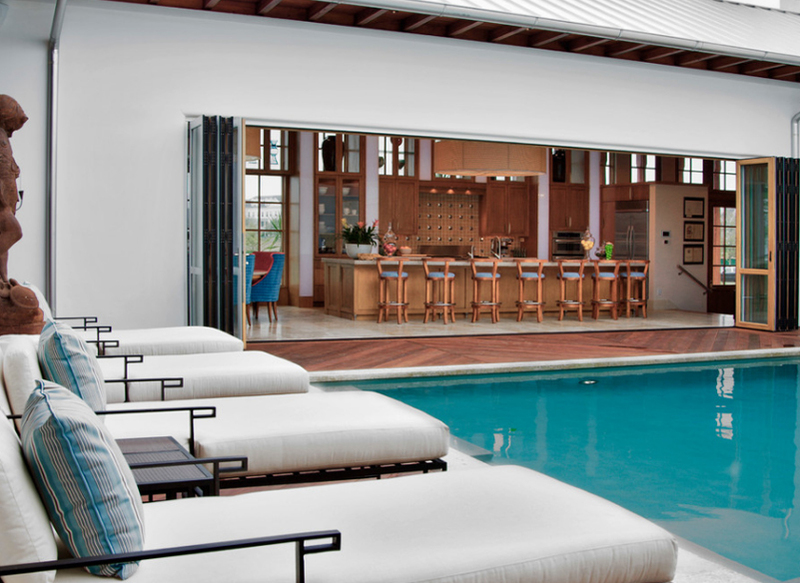 I mean, look at that long bar which opens directly towards the pool. Unlimited drinks for everyone. Have you seen this home already? I think that I might have included this home in one the lists that I have written in the past; I mean, why not though? 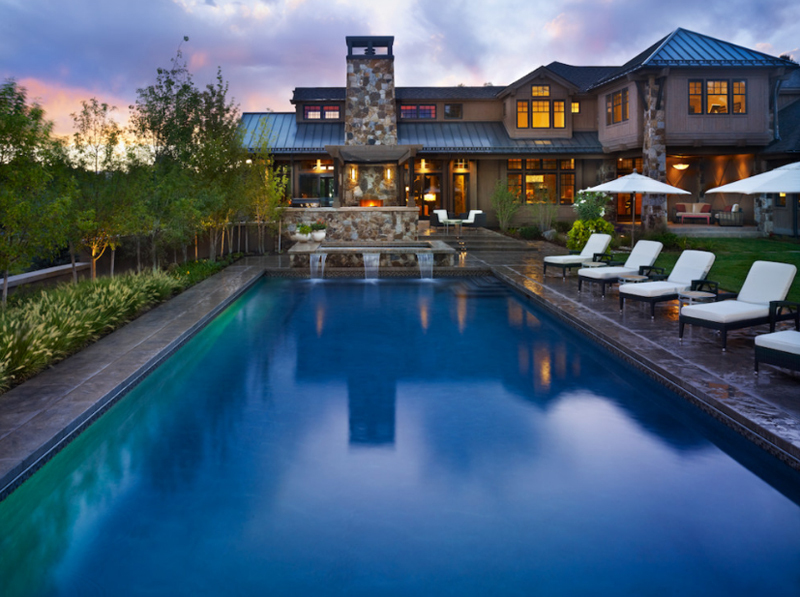 This Western home just looks really beautiful and it has a wonderful and large (might even be an Olympic-size) pool which could accommodate tons of people! Pool parties every weekend! Another swimming pool with a view as spectacular as this one! I don’t know much about the Grand Canyon but everything in here is just breath-taking! 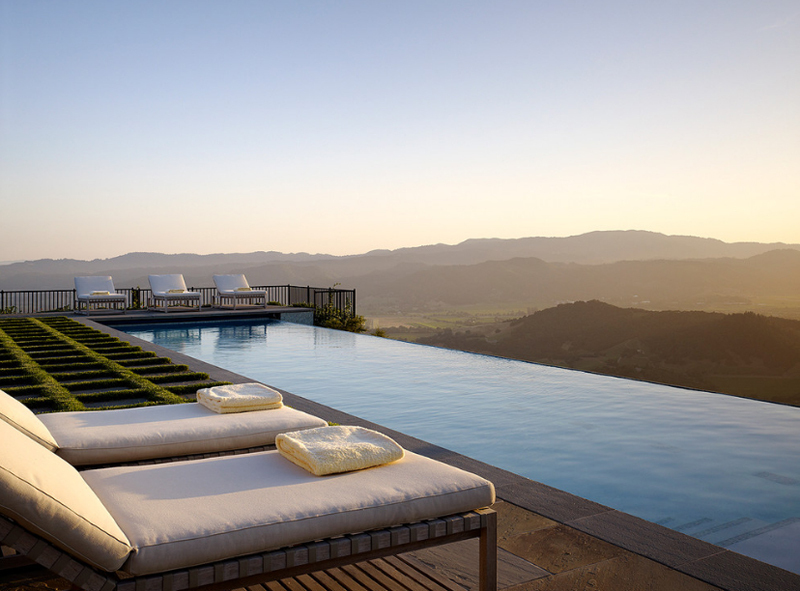 From the infinity pool to the mountains and back, I mean, come on! Who wouldn’t want to vacation here? Talk about a villa! This is definitely one stunning place to go home to everyday! Notice the symmetry in this home though? Maybe there’s a missing tree on one side and maybe some lounge chairs on the other side too, but I think that this is one grandiose home! If you have already seen the list A Variety of 20 Dining Room Chairs with Cushions, you will know that using cushions for chairs is a thing, not only for lounge or pool chairs but those chairs indoors too. More lists like this one from Home Design Lover!